The World Series of Poker (WSOP) has announced changes to its individual tax filing procedure that will be implemented for the 2015 tournament, and the adjustment could have significant impact on those who back players. The game’s most prominent competition says it will only provide IRS form W2-G to players winning more than $5,000 as it’s required to do so by law. Few topics are more stressing, complicated, and downright dreadful than that of taxes, especially in the United States. Though Caesars, parent company to the WSOP, says its interpretation of the tax code is correct, others tell a different story. A poker fan on Twitter posted a response he received from the IRS regarding form 5754. Kevin, known as “hoodskier” on the social media site, asked the governing revenue service if a casino is required to issue form 5754 when groups support a single poker player by splitting the buy-in. Or in layman’s terms, yes, the casino is required to produce form 5754 to groups sharing winnings. Of course, groups will still collaborate to support the high buy-ins that come with potentially huge payouts. The only difference is that the pact will be responsible for appropriately filing their taxes to lessen the player’s total income and ultimately reduce his or her tax liability. Taxes stemming from the game of poker are some of the most complex filings in the world, as players from 100 countries are expected to descend on Vegas later this month for the 46th Annual WSOP, and nearly all of those governments will want a piece of any player’s take. 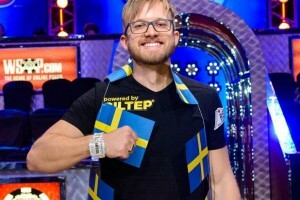 Martin Jacobson, last year’s Main Event champ, was able to enjoy all $10 million of his winnings as he lives in the gambling tax-free city of London. Had he maintained residence in his native Sweden, he would have been forced to pay 56 percent to the government. As with any tax or law advice, we highly recommend you discuss your specific situation with a professional.